Sometimes my self-imposed brief seems to be to collect obscure wine regions, preferably in or close to mountainous areas. Hence, my acceptance of an invitation to a Clairette de Die (pronounced ‘Dee’) harvest festival. This was the ideal focus for an exploration of the Diois (pronounced ‘Deewah’) area of the Drôme department, which lies just south of the stunning Col de Rousset pass, generally considered to be the north-south dividing point of the French Alps. To the north, the vegetation is typically continental with mountain spruce, larches and alpine cows; to the south it changes towards Mediterranean, with umbrella pines, ‘garrigue’ scrubland and hundreds of sheep.In wine terms, the Die area is included in the Rhône Valley region (though it doesn’t fit into either north or south categories); the town of Die is 50km (30 miles) southeast of Valence and the vineyards follow the Drôme River, a tributary of the Rhône. The vineyards are some of the highest in France (higher than most in Savoie for example), lying between 400 and 700 metres with a climate that is a cross between semi-continental and semi-Mediterranean. There are different versions of how the semi-sweet, delicate sparkling Clairette de Die got its name. Strangely it is not named after the Clairette grape even though it’s grown there. Sparkling wine had been made in this area for centuries, even in the days of Pliny, when Muscat was mentioned as grown here; however, it was most widely enjoyed in the late 19th century. At the turn of the 20th century, in the closest large towns of Lyon and Grenoble, the fizzy wine from Die was still sold in bars directly from a barrel – a little like Vin Bourru, the part fermented wine which is sold just after harvest all over France. Needless to say, it was cloudy with the yeast in suspension, but gradually it would clear leaving the deposit behind – so the name derived from this phenomenon of ‘clearing’ or ‘clairette’. The main grape grown is Muscat à Petit Grains (shown left) which for AOC Clairette de Die must be at least 75% of the blend, with the balance being Clairette, better known further south in the Rhône. Some of the best Clairette de Die is made with 100% Muscat. Clairette is an acidic grape used in particular here for the dry sparkling wines, previously Clairette de Die Brut but now, with stricter production controls, Crémant de Die, in which recent changes to the law state that small quantities of both Muscat and Aligoté must also be included.The area also makes a little still wine, the best from the appellation Châtillon-en-Diois, named after a village at higher altitude than Die – these are dry, fresh whites from Chardonnay and Aligoté, and light reds/rosés from Gamay and Pinot Noir grapes. Clairette de Die Tradition which makes up more than 80% of the production in the area is made in the Méthode Dioise Ancestrale. Like Asti, the idea is to preserve the delicate grapey flavour of the Muscat variety, however, Clairette de Die is bottle fermented. Each individual producer appears to carry out this method slightly differently although the principal remains the same. 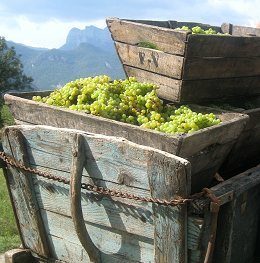 Muscat is harvested separately from the later ripening Clairette and the juice is kept at low temperatures. The must undergoes a very cool and slow first fermentation – local yeasts are said to start working with temperatures as low as 7°C. With the alcohol level at only around 5% – 6%, there is a light filtration to leave only a few active yeasts, and then the blending takes place before bottling in January. The appellation requires a minimum four months in bottle during which time fermentation continues to reach around 8% with pressure as high as 8 or even 10 Bar. The wine is filtered into a fresh bottle; some producers still use the method known as ’bouteille à bouteille’, disgorging the wine and then gently passing it through a filter and straight into the new bottle.The local cooperative, Cave de Die Jaillance dominates production making 80% of the region’s wine from 1075 hectares of vineyards. It has a sleek, modern set-up with a switched-on tour and visitor’s centre on the outskirts of the town of Die. An impressive 10% of the vineyards they handle are now organic, which may well be the highest percentage for any wine cooperative in France. Domaine Achard-Vincent are possibly the finest estate in the area – with organic vineyards since the 1970s, they have recently converted to biodynamic methods. Yapp import their basic Clairette de Die and Crémant de Die into the UK. Other names with decent quality include Domaine Poulet et Fils and Union des Jeunes Viticulteurs Recoltants (a vigneron grouping with members who aren’t as young as you might think). Clairette de Die is a deliciously fresher alternative to Asti with low alcohol of around 7.5% and a floral, grapey character. It can be drunk as a pick-you-up at any time of day. It works well with walnuts, another Diois speciality and provides a light sweet alternative to dessert wines for the end of a long dinner party. 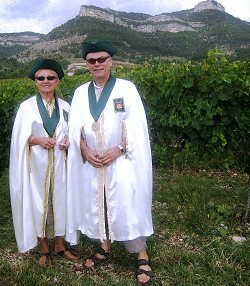 The morning the festival dawned bright, allowing a quaint little harvest procession to pick the first grapes from the heart of the vineyard area in the village of Vercheny (left, producers Claudie and Jean-Pierre Achard-Vincent). A symbolic pressing of the grapes in an old wooden press took place in the village square, but by lunchtime the festival became a washout and the mayor had to urge people to go home quickly with some of the season’s worst floods due. It was a sad day for the local producers who had set up their stands – lack of sales adding to their worries about the weather and how it was affecting their vines.This region is worth a detour for its spectacular scenery and to taste a really unusual product in situ. The laid-back town of Die is worth exploring too with a couple of surprisingly decent restaurants (Le Vieux Sonneur and the vegetarian/organic Tchai Walla) and unusual shops including a delightfully old-fashioned nougat and chocolate shop.